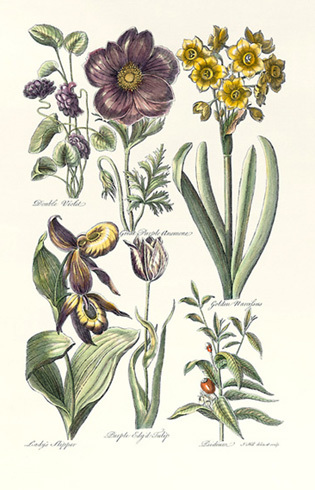 Hand-coloured lithographs taken from Hill's his illustrated botanical compendium The Vegetable System. John Hill (c. 1716 – 21 November 1775), called because of his Swedish honours, "Sir" John Hill, was an English author and botanist. He contributed to contemporary periodicals and was awarded the title of Sir in recognition of his illustrated botanical compendium The Vegetable System. He was the son of the Rev. Theophilus Hill and is said to have been born in Peterborough. He was apprenticed to an apothecary and on the completion of his apprenticeship he set up in a small shop in St Martin's Lane, Westminster. He also travelled over the country in search of rare herbs, with a view to publishing a hortus siccus, but the plan failed. His first publication was a translation of Theophrastus's History of Stones (1746). From this time forward he was an indefatigable writer. He edited the British Magazine (1746–1750), and for two years (1751–1753) he wrote a daily letter, "The Inspector," for the London Advertiser and Literary Gazette. He also produced novels, plays and scientific works; and was a large contributor to the supplement of Ephraim Chambers Cyclopaedia. His personal and scurrilous writings involved him in many quarrels. Henry Fielding attacked him in The Covent Garden Journal, Christopher Smart wrote a mock-epic, The Hilliad, against him, and David Garrick replied to his strictures against him by two epigrams, one of which runs: "For physics and farces, his equal there scarce is; His farces are physic, his physic a farce is." He had other literary passages-at-arms with John Rich, who accused him of plagiarizing his Orpheus, also with Samuel Foote and Henry Woodward. From 1759 to 1775 he was engaged on a huge botanical work--The Vegetable System (26 vols fol.) --adorned by 1600 copper-plate engravings. Hill's botanical labours were undertaken at the request of his patron, Lord Bute, and he was rewarded by the order of Vasa from the king of Sweden in 1774. He had a medical degree from Edinburgh, and he now practised as a quack doctor, making considerable sums by the preparation of vegetable medicines. Of the seventy-six separate works with which he is credited in the Dictionary of National Biography, the most valuable are those that deal with botany. He is said to have been the author of the second part of The Oeconomy of Human Life (1751), the first part of which is by Lord Chesterfield, and Hannah Glasse's famous manual of cookery was generally ascribed to him (see Boswell, ed. Hill, iii. 285). Dr Johnson said of him that he was "an ingenious man, but had no veracity."